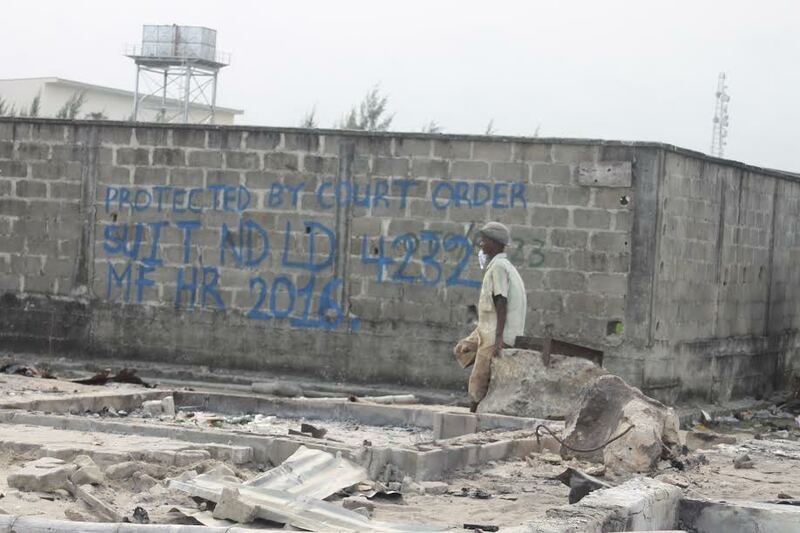 For residents of Lagos informal communities—often designated as slum settlements—bulldozers accompanied by heavily-armed and tear-gassing security operatives are regular visitors to their enclaves. 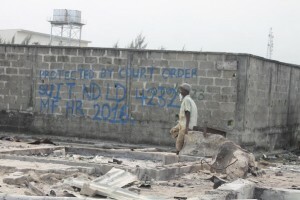 In the last one year, rampaging bulldozers have flattened Badia, Oshodi, Ilubirin, Otodo-gbame, and several communities in Lagos on the orders of state authorities, or their collaborating private actors. The reasons officially advanced for the demolitions have been historically flimsy, and duplicitous. The most disingenuous of them all is ‘urban renewal’, which represents an omnibus term for a variety of official intentions to remove poor residents from their places of abode. The often-disclosed intentions range from crime-fighting, sanitation, environmental protection, building control, city beautification, tree-planting, road widening, gutter construction, set-back enforcement and so forth. Consequently, thousands of families have been displaced, their businesses and livelihoods ruined, their children’s education and social networks disrupted. Threats of future evictions loom. “So, what do we do next?”, asks Mrs. Biola Idiefo Ogunyemi, a widow and mother of six who lost two residential buildings with a total of 38 rooms, three shops, and a bar that she had owned since 1991. This question prompted the January 17, 2017 strategy meeting between SPACES FOR CHANGE and the representatives of slum communities, mainly from Badia-East, Ijora Lagos. It was clear from the beginning of the meeting that everyone shared a common concern: that state authorities adopt more inclusive approaches that involve poor and excluded people in its urban renewal and infrastructural development agenda. To achieve this goal, there was need to go beyond the traditional campaigning and litigation tactics they have historically employed, and work towards widening the channels of communication between marginalized communities and development planning agencies. It is not only the residents of Badia-East that are thinking along this line. On January 24, 2017, evicted residents of Otodo-gbame hosted a press briefing to update the media on the outcomes of their struggle for resettlement and compensation. 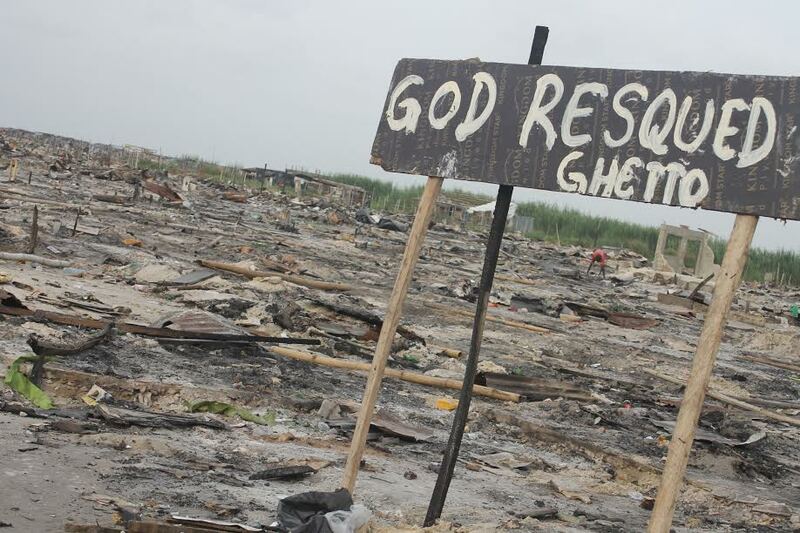 Beginning from the 9th to the 13th of November 2016, residents of Otodo-Gbame fishing community came under heavy attack from vandals, arsonists, and security operatives who brutalized and forcefully evicted them from the land they have occupied for many years. Tens of thousands were displaced and so many now suffer homelessness. 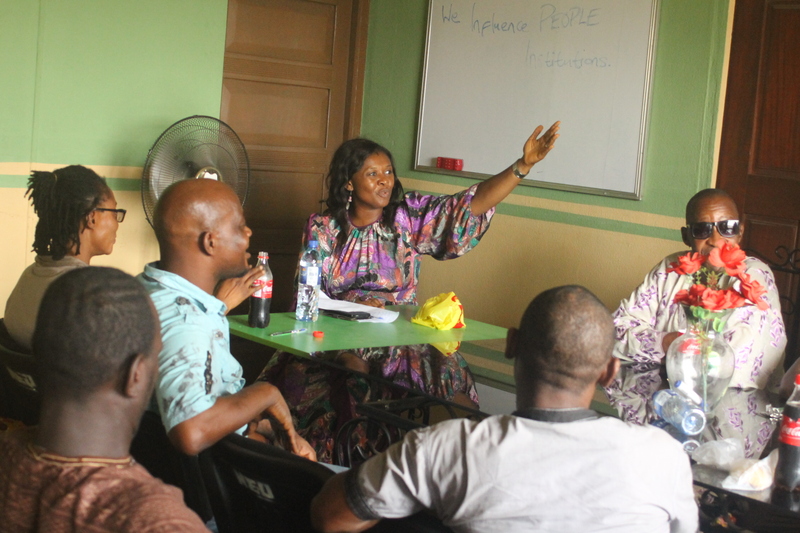 SPACES FOR CHANGE’s Aizighode Obinyan joined the Otodo-gbame community leaders and the crowd of no fewer than 50 residents to appraise the legal and advocacy actions that have been taken to seek redress since the November 2016 destruction of the community. Otodo-gbame’s traditional ruler, Baale Dansu Humkpe, who had just been released from police detention could not hide his grief. Despite convening several press briefings, protest marches, petitioning key government departments, and conducting high-profile media campaigns on television and the social media, the Lagos State government has paid little attention to their demands for reparation. Even the outcome of the public hearing the Lagos State House of Assembly organized in December 2016, inquiring into the circumstances surrounding the destruction of Otodo-gbame has not been made public. As a result of this glaring inaction, perception is growing that the state authorities have taken sides with the elite property grabbers who want to take over their land. Determined to resist the takeover, the Otodo-Gbame community, predominantly inhabited by the Oguvi fishing tribe are taking a number of steps to retain the title and occupation of the land on which they live. For instance, they have begun to reconstruct their demolished homes, and erecting temporary structures on the land for residential and commercial purposes. State authorities have not supported the community rebuilding efforts despite repeated appeals to them. 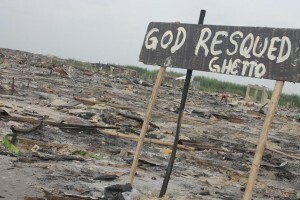 Weeks before the event in Otodo-gbame, SPACES FOR CHANGE visited Ebutte Metta and other densely-populated, swampy, informal settlements in the Lagos Mainland axis—such as Oko Baba, Sawmill, Otto-Illogbo, and Toluwani communities—that have in recent times, been threatened with forced evictions. Meeting with the leaders and representatives of these communities enabled SPACES FOR CHANGE to better understand the housing and environmental disadvantages that they are facing. The lack of genuine consultations with residents regarding their resettlement, and compensation is feeding fears among the community members that they might lose their homes and neighbourhoods in which they have invested a considerable portion of their life savings. Discontent and anger at the scheduled demolition is exacerbated by the planned relocation of the Sawmill Village. Residents of these areas consist mainly of the poor or low-income earners working in unskilled, low-wage, and often informal sector jobs and trade. The relatively low cost of living and proximity to the thriving economic centers of Lagos Island make these blighted areas a magnet for those within the low income bracket. One important outcome coming out of these engagements is the recognition by slum residents across the state that they cannot do this alone. They need the support of all relevant stakeholders working together to continually explore, identify and expand opportunities for community empowerment and policy engagement. They need to collaborate with similarly-situated communities in order to collectively identify and challenge the problems of urban deprivation and exclusion through capacity building, human rights education and policy dialogues leading to meaningful consultation, information sharing, collaborative problem solving, and skills transfer. Rather than stand-by and watch their economic, social, cultural and emotional lives being shattered without restraint, these communities have resolved to work together with SPACES FOR CHANGE, deploying a variety of legal and non-legal strategies to defend their housing rights as well as their rights to live in the city. Inspired by this shared commitment among slumdwellers, SPACES FOR CHANGE is now working to promote and strengthen the building of a cohesive network of community organizations with a view to building a strong collective voice primed to grip official attention to cross-cutting development and human rights priorities. With such a powerful network in place, communities targeted with evictions can negotiate better compensation terms, litigate in the public interest in a class action, and launch a joint onslaught against the offending public institutions. On the other hand, state institutions will have begin to appreciate the importance of approaching such a group when making certain policy decisions and conclusions on key issues, in such a manner as to achieve better access to housing, and greater planning efficiency, particularly for the most vulnerable populations.